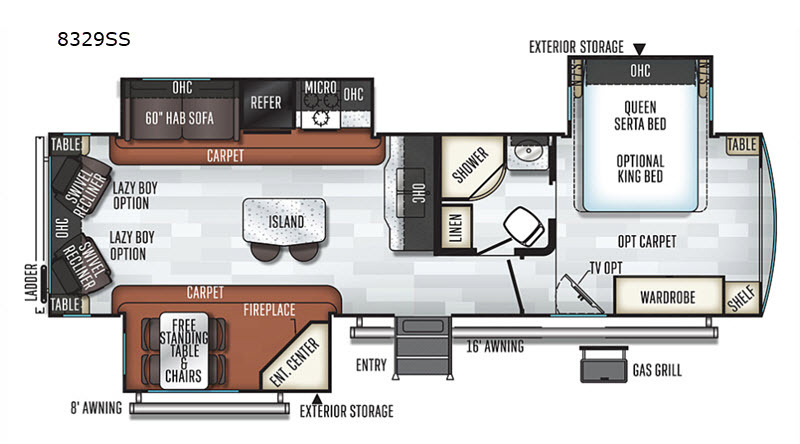 Your family of four will enjoy all the space throughout this travel trailer with three slides. The combined kitchen and living area features a kitchen island with two bar stools. You can enjoy your meals at the free-standing table with chairs, and after dinner come relax in the rear living area with two recliners. Within the roadside slide out there is a 60" hide-a-bed sofa and in the corner you will find an entertainment center with a fireplace. 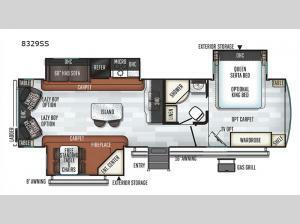 This unit includes a Serta queen bed in the front private bedroom, plus a wardrobe for all your things. With exterior storage included in this travel trailer, you can bring along the extra camping chairs and yard games for the kids!